BELIZE CITY, Mon. 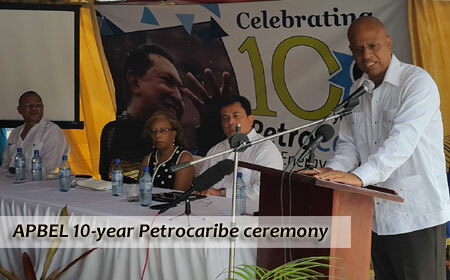 June 29, 2015–Alba Petrocaribe Belize Energy Limited (APBEL), the Belizean company through which Petrocaribe fuel is bought from Venezuela, today commemorated the 10th anniversary of the Petrocaribe agreement between the governments of Venezuela and Belize at its headquarters on Coney Drive in Belize City. The regional social development loan program, which was the brainchild of former Venezuelan president, the late Hugo Chavez, has, of late, become one of the most widely discussed topics in local public circles, and depending on who you listen to, the spending of the funds that are made available by means of that loan program has either been touted as a means for unprecedented infrastructural works, or criticized as a slush fund through which the ruling party has been able to muscle its way to a series of political successes. A Petrocaribe alliance, which is made up of 17 Caribbean and Central American states, in addition to Venezuela, was launched in June 2005 when it was decided through the Bolivarian Alliance of the Americas that the initiative would go beyond oil production to promote economic cooperation as well. During today’s ceremony, Minister of Energy, Science, Technology and Public Utilities, Hon. Senator Joy Grant, posthumously praised Chavez for bringing his vision to reality so that the peoples of the Caribbean can reach their potential through his country’s oil resources, and recognized current Venezuelan president, Nicolas Maduro, for continuing on the path of his predecessor. “It is only fitting that we embrace this initiative in the way we have”, she cited, adding that there have been great improvements that have taken place since the program was restarted in 2009 after a 4-year pause. APBEL was formed in September of 2012 to carry out the business and logistics of the initiative in Belize – which specifically involves bringing in fuel sold directly at world market prices from Venezuela to Belize, distributing it through PUMA and paying only 40% immediately, with the other 60% being paid on concessionary terms over 25 years at an interest rate of 1%. Prime Minister Dean Barrow also made a presentation in which he saluted “the vision of Chavez” and described the regional initiative as a “tremendous boon” for Belize. He spoke about the “local campaign” which has been launched by those who, as he pointed out, say that they do not disagree with the program itself, but with the way in which it is being operated. “I do not buy that, especially when there is a challenge in the courts to shut the program down – that’s local politics”, he asserted. “It’s a great day. In my view, the majority of the people in this country are extremely grateful for the Petrocaribe program and it is just a chance to congratulate those that are making it happen and to contribute to the memory of Comandante Hugo Chavez”, Barrow told Amandala in an interview after his speech. During his presentation, Ambassador of the Bolivarian Republic of Venezuela in Belize, His Excellency Yoel Perez Marcano, maintained that despite the fact that the program has been threatened by recently declining world prices of oil, “no circumstances, not political or economic” will destabilize the “highly satisfactory” friendship between Venezuela and its allies, including Belize. APBEL’s deputy chairman, John Mencias, told us that the company is basically building on their core mission, which is centered on importation and distribution of fuel, and that once they have amassed and consolidated enough retained earnings, then APBEL will start to expand the project in the future.